I wanted to make a heavy, extra warm cardigan. Loved this one from Ermanno Scervino, and giving a close look at the photos, looks like the yarn used for this sweater was pretty much the same size of the wool-alpaca blend I got at my yarn store. 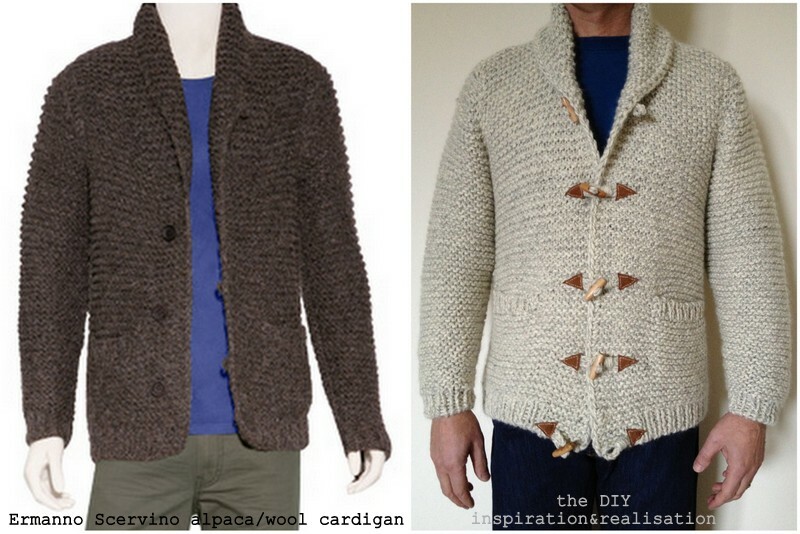 The work of this cardigan is extremely simple, and goes really fast. It's all garter stitch, with 1:1 ribbing on waistband, wrists and pockets. It has two on the inside pockets and a shawl collar. 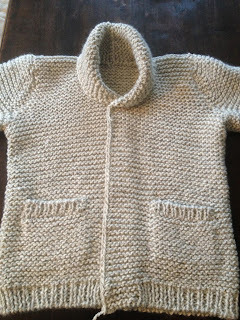 I used needles size 8 mm, and worked the whole cardigan in garter stitch with 1:1 ribbing on wrists, waistband and pockets. 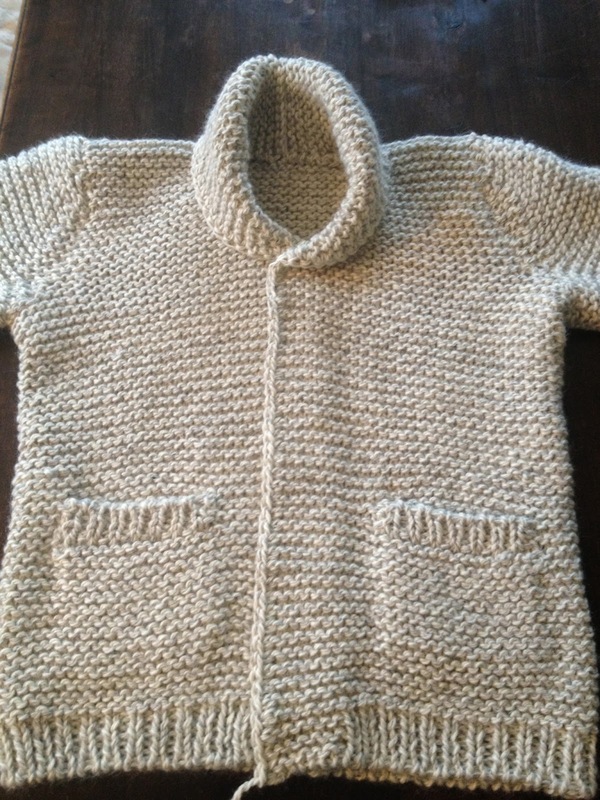 This is extremely heavy and warm: the finished cardigan took me a whole 16 balls of yarn (100 gr. each). 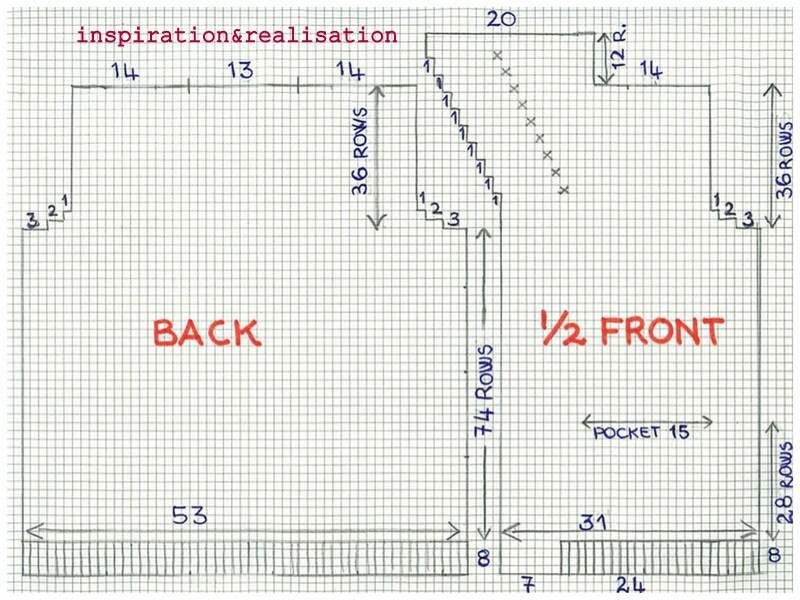 10 stitches x 10 rows garter stitch = 4-1/4" x 2-1/4"
Work the second half of the front mirroring the diagram. 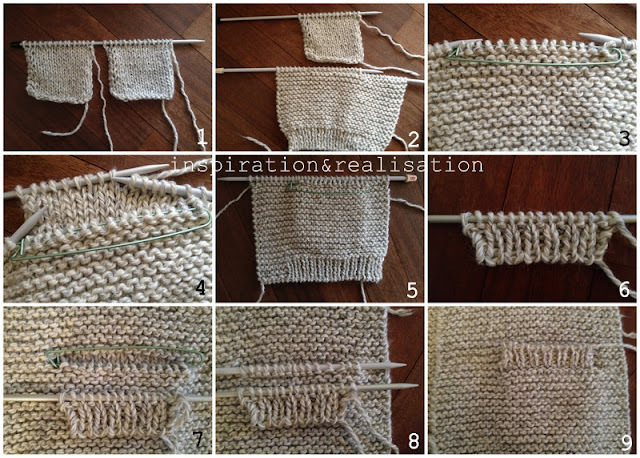 * the waistband on the front is knitted on 1:1 ribs except for the 7 stitches in the center (that would be the overlap of the cardigan), which are knitted in garter stitch. 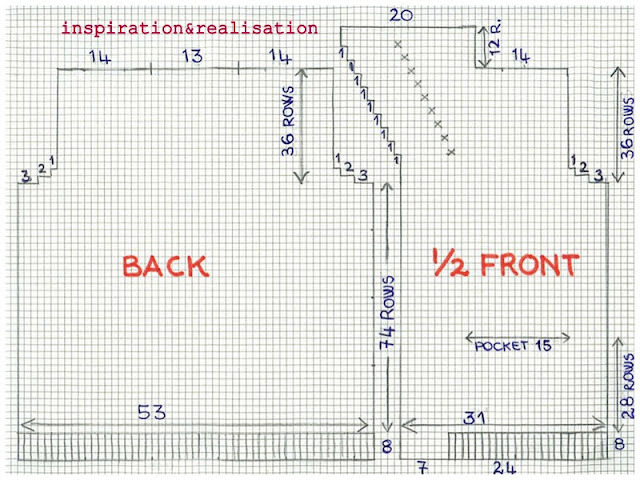 * I joined the shoulders with the three needles method, and so the two parts of the collar. 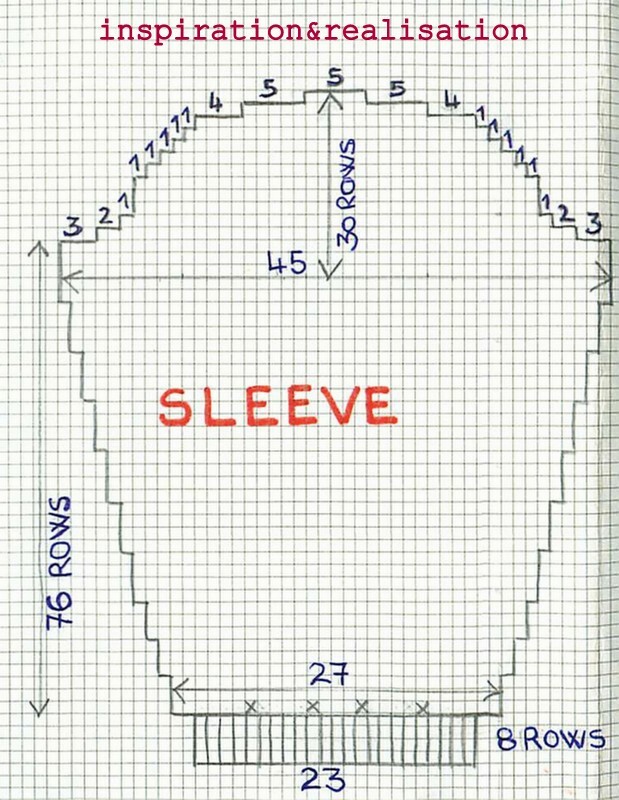 The collar will have the join in the middle of the back. * I crocheted around the opening one row of single crochet stitch, to give the finish edge a smooth finish. 5* keep knitting regularly until the end of the front. 9* bind off using the three needles technique the 15 stitches of the opening of the pocket. Now sew the stockinette part of the pockets onto the inside, and the sides of the ribbing. Weave in the ends and the pocket is ready. 9* final touch: use the leather triangle and place it on top of the chain stitch cord base facing the center of the cardigan. Highly recommended the use of a leather needle: [Dritz(R) Glovers/Leather Hand Needles-Size 3/7 3/Pkg ] to sew with a thick thread around the perimeter of the triangle. I left about 1/8" edge. Hi D! I think your work has the WOW factor... again. Great creation, well done to you! Absolutely love this! Especially the tutorial for making your own toggle button closures. This is one of those seriously? sweaters because who else could serioiusly make one that looks so much better than the inspiration? I am so envious of your knitting skills! ): the things you create are amazing! 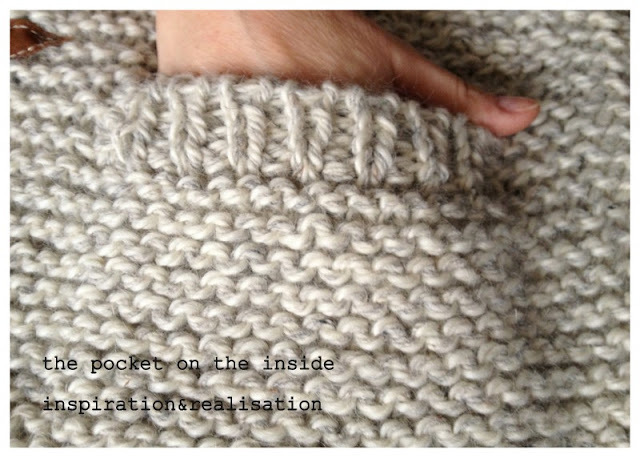 The tutorial is amazingly easy to follow, love the toggles and leather accents. You did a great job. Thanks again. Hi Sylvia! My husband is 6'2", so you have to adjust the sizing a bit. Let me know how it comes out, and feel free to ask if you have any questions :) thanks for stopping by !! d.